Our trap field is an ATA regulation field and can be used for shooting singles, doubles, and handicap trap. The clay target is released from a trap house located 16 yards in front of the shooter (or further, if shooting handicap), within a 27 degree arc left or right of the center of the house. Five targets are shot from each of the five stations, providing a wide array of angles for the shooter to master. Trap is a challenging game, but a good place for novice shooters to get started. Like trap, five stand shooters are presented with five targets at each of the five stations. However, these targets are released from a variety of locations as singles, report doubles, and true pairs. Five stand is our most popular offering at NCSC and is a great way to get a Sporting Clays-like experience in a small amount of space, with very little walking. Our recently constructed five stand facility has a roof to keep the rain and snow off, as well as a warming room for cold winter days. For variety, NCSC has 12 traps on the five stand field, including machines throwing standard, midi, rabbit, and battue targets. Wingshooters find five stand to be a great way to practice before the hunting season starts or to keep their skills sharp year round. During regular operating hours, NCSC offers an introductory package for new shooters. We start you out with a classroom session where safety is the primary focus. We also discuss the operation of the guns used in clay target shooting and a variety of clay shooting games. Then we head out to the range to break some clays! This introduction includes classroom instruction, loaner gun, ammunition, targets, and the necessary safety gear. 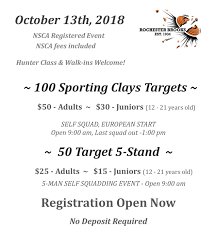 North Country Sportsmen’s Club hosts a number of National Sporting Clays Association (NSCA) registered events for competitive shooters. Not a member of NSCA or you don’t consider yourself a competitive shooter? Watch for event announcements because there’s almost always a “hunter” class just for you to join the fun.